Hudson City Hall is located at 520 Warren Street, Hudson NY 12534; phone: 518-828-1030. 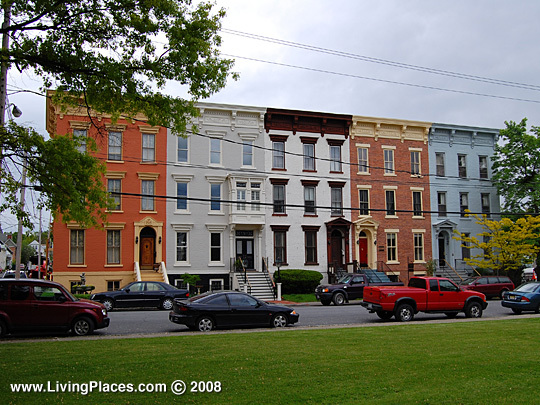 The city of Hudson, on the east bank of the Hudson River, and originally known as Claverack Landing, was settled in 1783; its proprietors coming chiefly from Providence and Newport, Rhode Island, and Nantucket and Edgarton, Massachusetts. One hundred and fourteen miles from New York and twenty-eight from Albany, it is the head of natural navigation on the Hudson River. Nature has been most kind, as a high bluff bounds the city on the river side, and a long slope east- ward gives one of the finest systems of sewerage in the world. Under this bluff Henry Hudson, with the "Half Moon," searching for a waterway across the continent, anchored and from this fact the city has taken the name which it now bears. Hudson soon became noted for its shipping, and was formerly a whaling port of great importance. The Quakers, who settled here, intermarried with their Dutch neighbors, who had followed them to Hudson, and today Quaker and Dutch names still survive; and the Quaker meeting-house, and the Dutch Reformed Church, are reminders of the early traditions of this small but venerable city, which, in many things, still adheres to the conservatism of its founders. When the city was young many industries selected Hudson as a site. The Steel Tired Wheel Company is one of the largest of the industrial concerns of Hudson today. The city's brewing interests have long been noted, and the extensive plants which furnish Evans' and Granger's ales, have brought world-wide fame to Henry Hudson's old anchorage. Lumber mills and tobacco factories continue to flourish, and, in later years, large knitting mills have been erected, a recent combination bringing together the two largest of these, under the name of "The Union Mills." The river front site which for so many years the Hudson Iron Company occupied, has been recently purchased for a cement plant; the stone and clay, but a little distance back being admirably suited for this purpose. The plant proper will, when built, cost about a million of dollars and will be a model of its kind. Nature intended Hudson for an ideal home and manufacturing city. It is healthy, it is central, and living expenses are very moderate. The Hudson River furnishes a waterway to the north and south, and incomparable railway facilities afford first-class transportation for passengers and freight in all directions, while the immediate farming district is easily reached by a third-rail electric system. A mosquito fleet of small steam yachts brings the neighboring towns on the river into close and convenient relations and the prosperous village of Athens, on the opposite bank of the Hudson, is reached by frequent ferry. Desirable building and residence sites are in the market at fair values, and the manufacturing advantages, which this city of ten thousand offers, are sure and substantial. Labor troubles are unknown; Hudson, in its life of nearly a century and a quarter, never having had a single strike. An improved railroad service has brought Hudson into competition with the suburban towns of New York, and shopping and theatre parties frequently take advantage of the reduced rates and make excursions for the day. The shrewd real estate experts are buying further from New York, as they read in the present demand for suburban property, a reasonably sure failure of supply in the immediate future. Hudson's taxes are moderate : her fire department a source of great pride; her police force a credit : and her public schools so nearly a model, that cities many times the ten thousand of Hudson profit from a study of the system which has accomplished such great results.